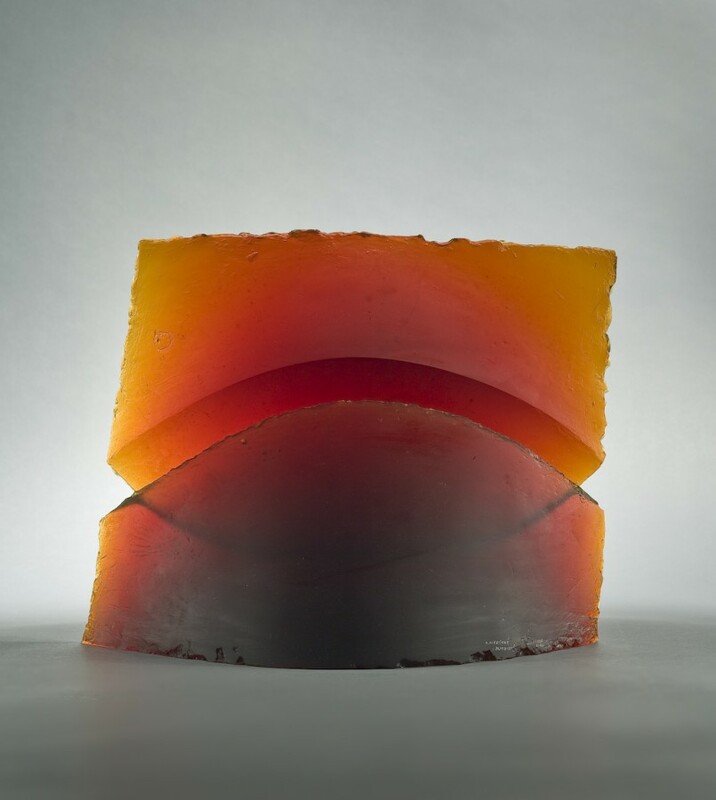 Dante Marioni creates sculptures that are fully embedded in the traditions of glass making but are absolutely contemporary in form, color and composition. 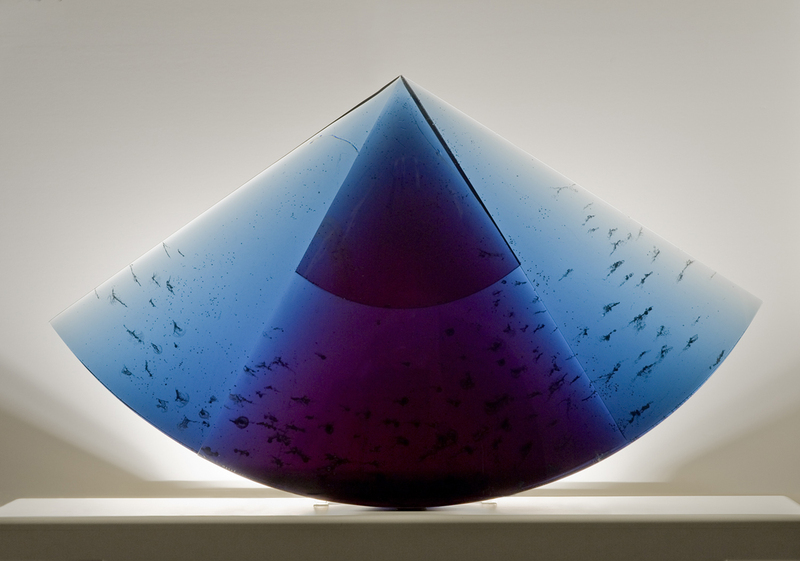 Today Dante stands as one of the most significant artists working with glass of his generation and is honored as such by museums, critics, collectors and above all, his peers. Dante is represented by Ken Saunders Gallery, Chicago, Illinois. 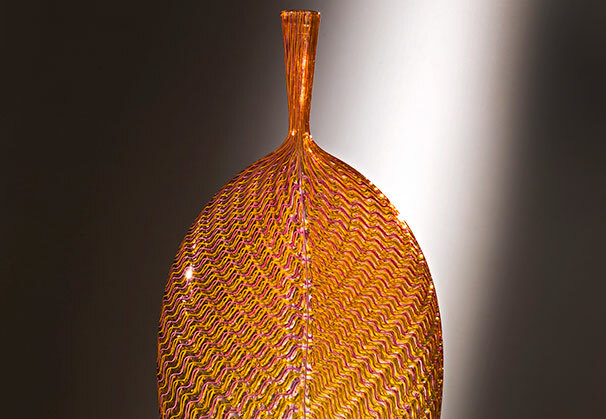 Dante Marioni burst onto the international glass scene at the age of 19 with a signature style that has been described as the purest of classical forms executed in glass by an American glassblower. 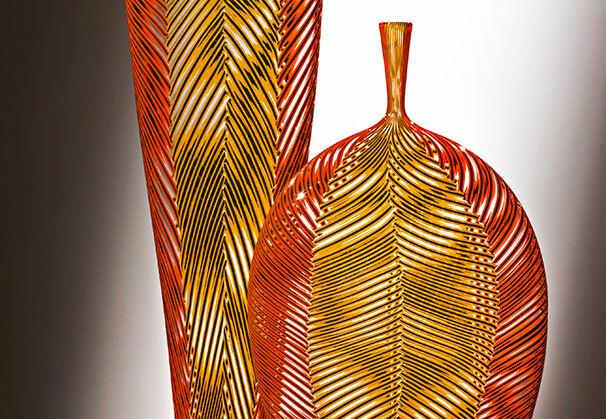 His amphoras, vases, and ewers are derived from Greek and Etruscan prototypes, yet they are imaginatively and sometimes whimsically reinterpreted. 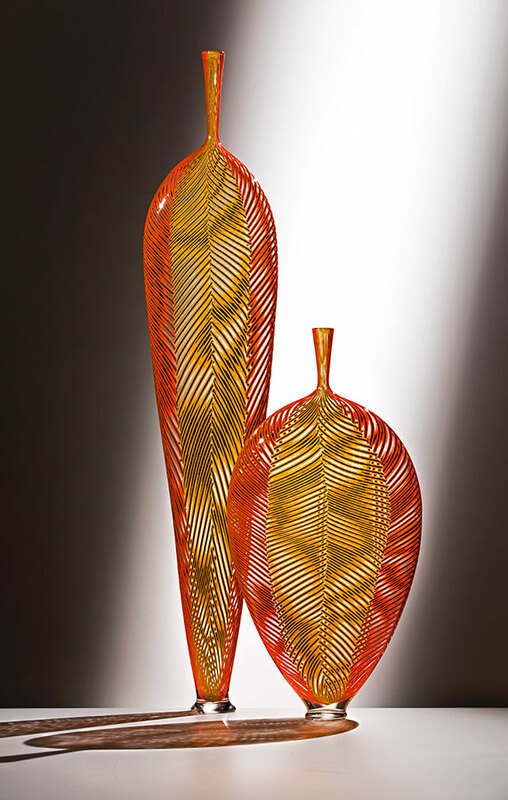 His impossibly elongated, sinuous shapes are made with bright and saturated contrasting colors. 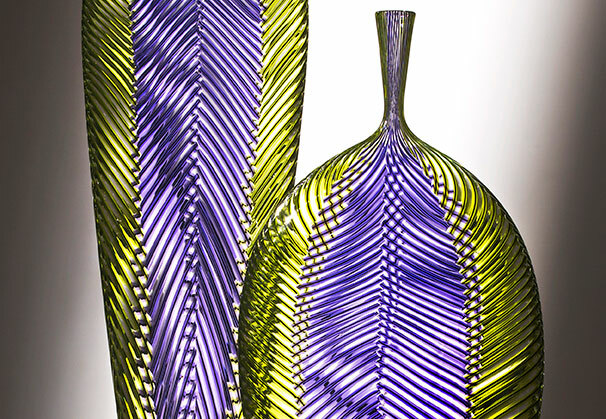 Marioni’s sophisticated glass objects evoke the rich tradition of classical Mediterranean pottery and bronzes, and of Marioni’s training in centuries-old Venetian glassblowing techniques with some of the greatest masters in contemporary glass. 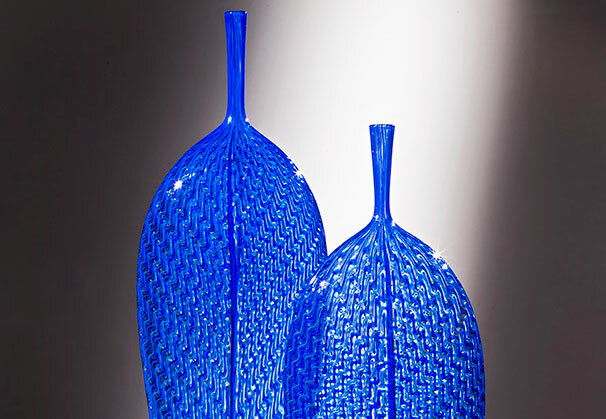 The son of American studio glass pioneer Paul Marioni, Dante Marioni was raised in a family of artists that includes two well-known uncles, painter Joseph Marioni and conceptual artist Tom Marioni. Marioni first held a blowpipe at the age of nine. By the time he was 15, he was working after school at one of the first cooperative hotshops and showrooms, The Glass Eye, in Seattle Washington. 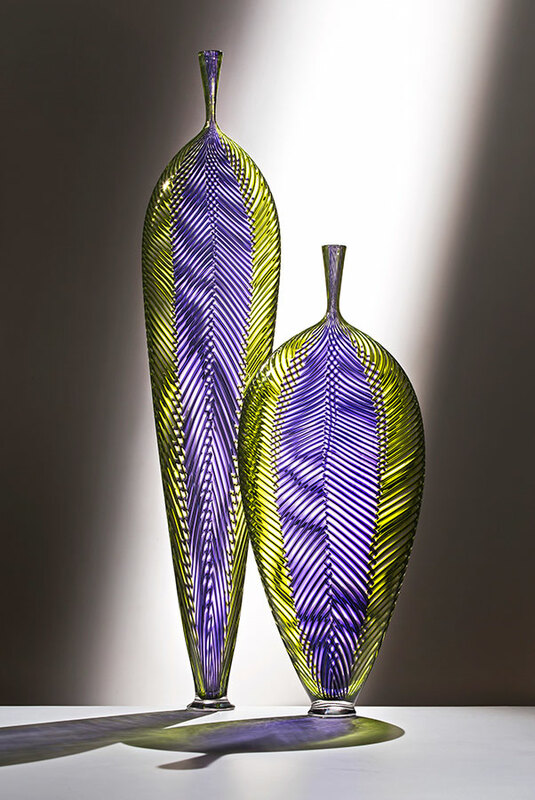 Although he loved glassblowing, making production studio glass felt limiting. 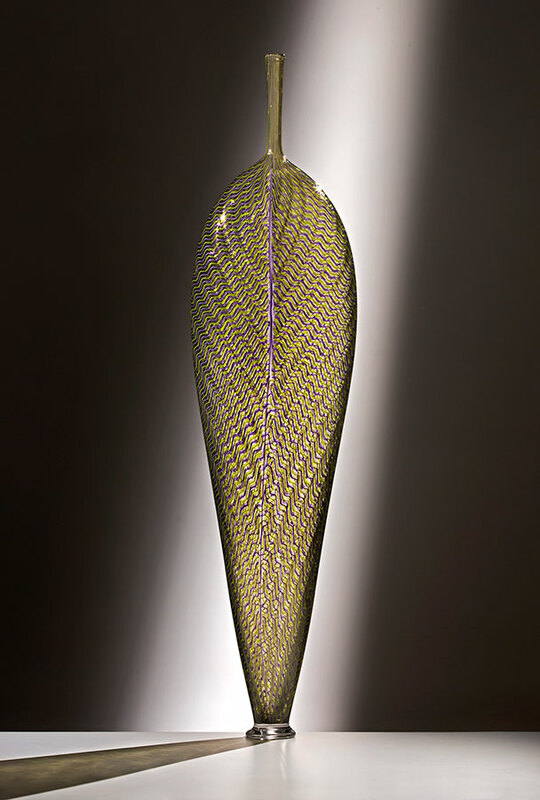 “The prevailing aesthetic [in American studio glass in the 1970s] was loose and free-form” observed Marioni, “I personally had no interest in that.” Around the same time he met up with Benjamin Moore, another studio glass pioneer, and watched Moore make a perfectly symmetrical, on-center glass form inspired by Venetian glass. It had a dramatic and lasting effect on Marioni, who had not previously seen this type of glassblowing. Moore soon became a great mentor and friend. “I worked with Benny any chance I got and still use his studio to this day to make some of my really large pieces,” Marioni says. 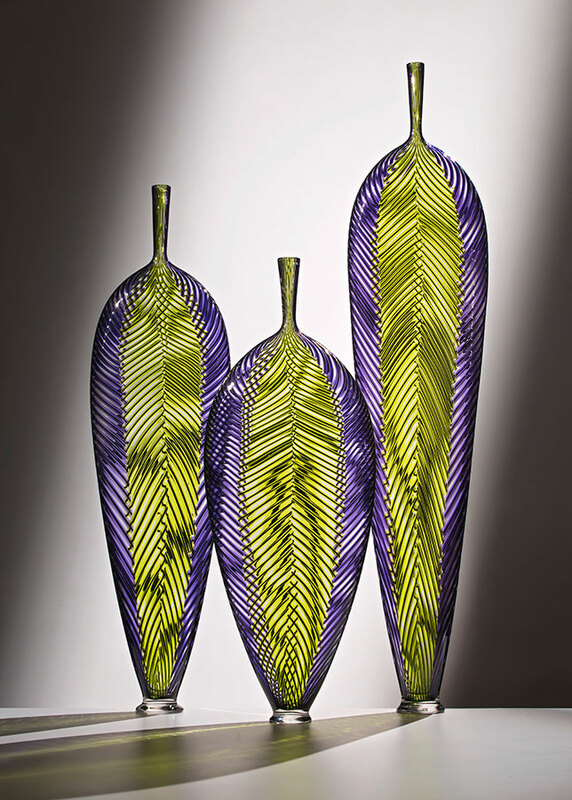 He also studied with other well-known studio glass pioneers, such as Fritz Dreisbach and Richard Marquis, who is widely recognized for his unique interpretations of Venetian decorative techniques. 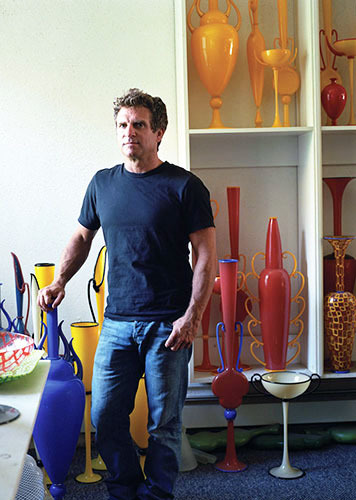 At the age of 23, Marioni had his first sell-out gallery show in Seattle that featured his Whopper vases. This series introduced his signature, monumental forms and two-color style, and earned him a prestigious Louis Comfort Tiffany Fellowship. 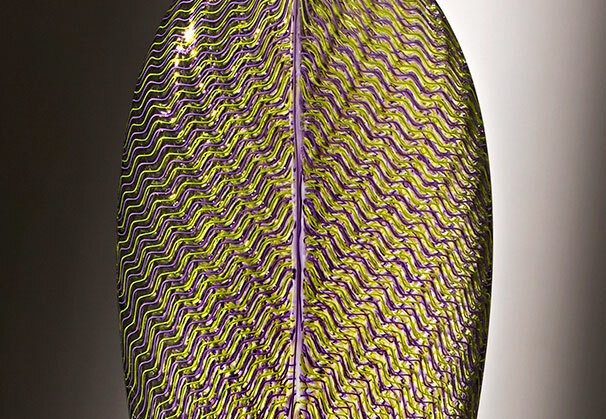 After two decades of experimentation, Marioni now creates a diverse range of tall, iconic forms with surface treatments such as murrine (mosaic) and reticello (air bubbles within a net pattern) in an ever-changing array of vibrant colors. 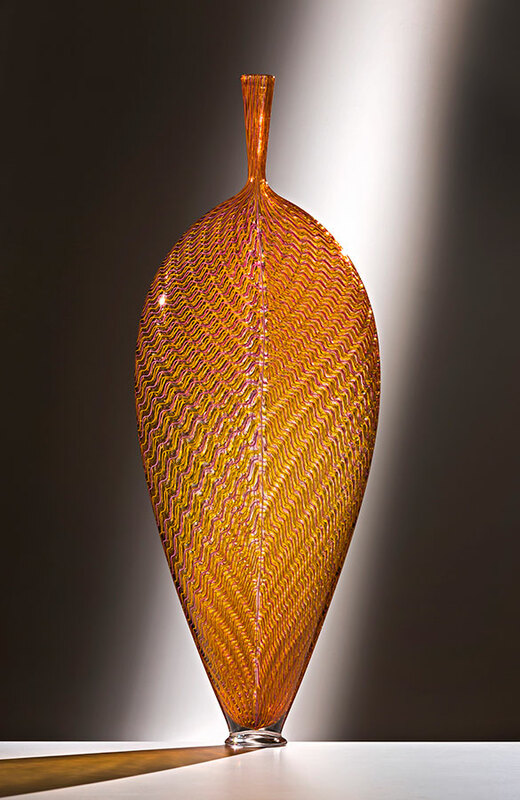 His most recent works are sculptural vessels inspired by the leaf. 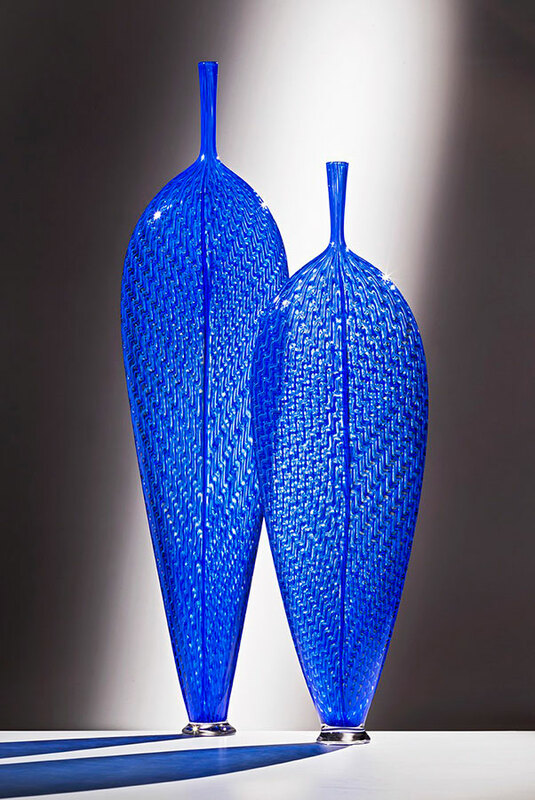 “Not the leaf in nature, but the stylized forms found in the decorative arts,” Marioni notes. 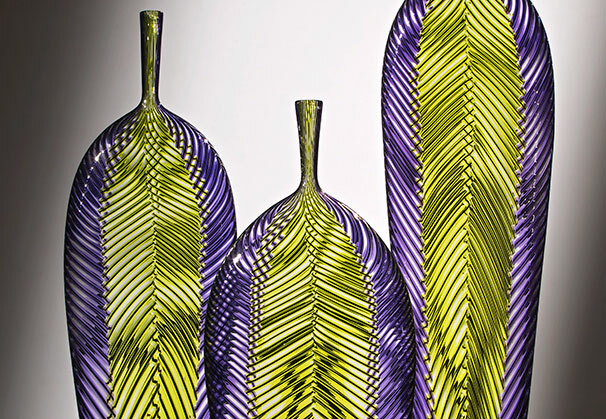 The new vessels are beguilingly intricate, inventive, fresh and tradition-breaking. While his earlier work was about “form, conceived and executed from a design point of view,” his newest works focus on the exploration of color and pattern. For Marioni, making objects is about the art of glassblowing rather than the creation of glass art, the process rather than the result. 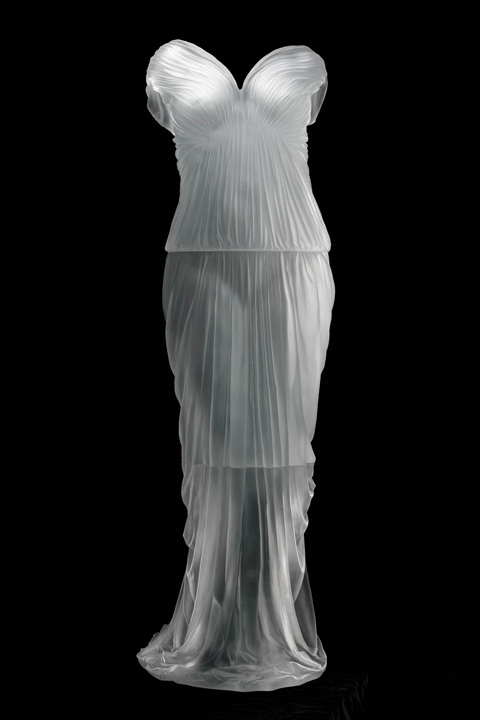 Marioni’s elegant works are the brilliant record of his on-going relationship with and exploration of this material. Dante Marioni's career embodies the central concept of the Italian workshop tradition, to respect your elders, listen and observe, work collectively and collegially, and, when your moment comes, to take all you have learned and make it your own, your unique contribution to the history of your medium. This Marioni does with such assuredness and grace as to make his vision seem inevitable, the perfect conjuncture of skill and perception, acknowledging a rich legacy while creating a world of his own. He is heir and innovator, and the sheer beauty of his vessels both gesture to an honored past and point the way forward to where that tradition may lead. 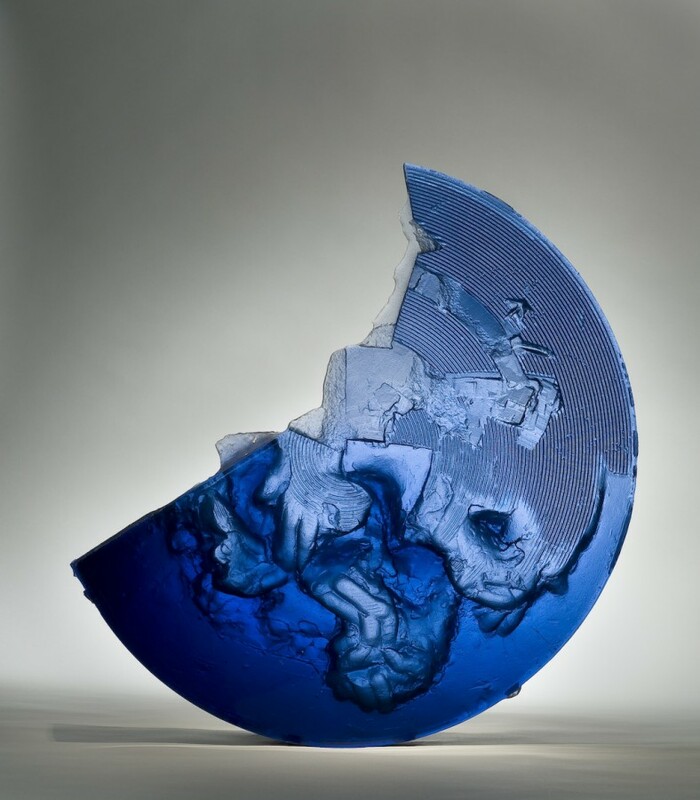 Dante Marioni creates sculptures that are fully embedded in the traditions of glass making but are absolutely contemporary in form, color and composition. 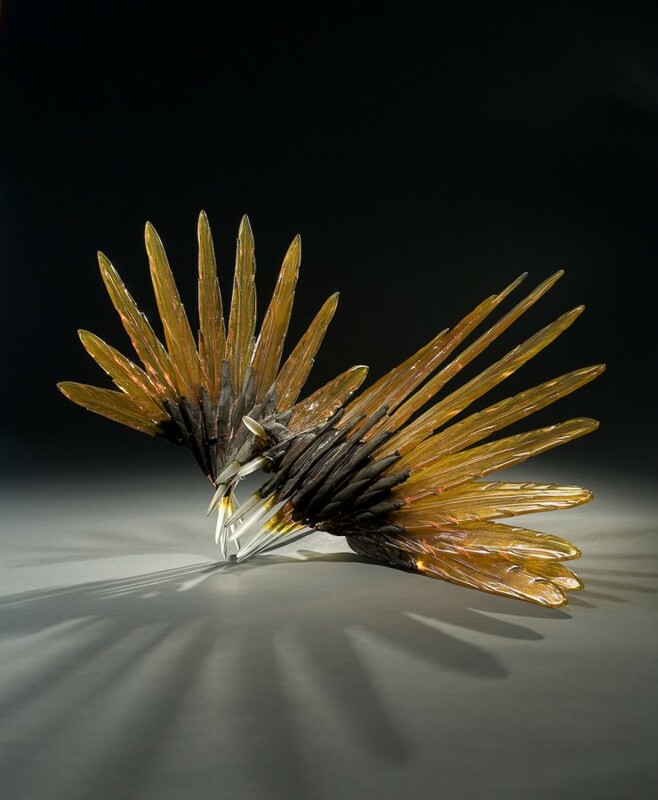 Today Dante stands as one of the most significant artists working with glass of his generation and is honored as such by museums, critics, collectors and above all, his peers. Click here for an artists' resume. We are grateful to Ken Saunders Gallery, Chicago, Illinois, for providing the Artist of the Month.